The Women in Leadership series of lunches continues on April 20th with Dr. Jann Freed. Jann is the author of Leading with Wisdom: Sage Advice from 100 Experts . She is also a leadership development and change management consultant. After a 30-year career at Central College, Jann is professor emerita of business management and the former Mark and Kay De Cook Endowed Chair in Leadership and Character Development. Dr. Freed is active at Central Presbyterian Church and a member of the Women’s Leadership Connection of United Way. WCI: When one looks at your background in teaching and coaching leaders we are curious, which of the eight civility practices, that are taught through Wallace Centers of Iowa programs show up in the work you do? 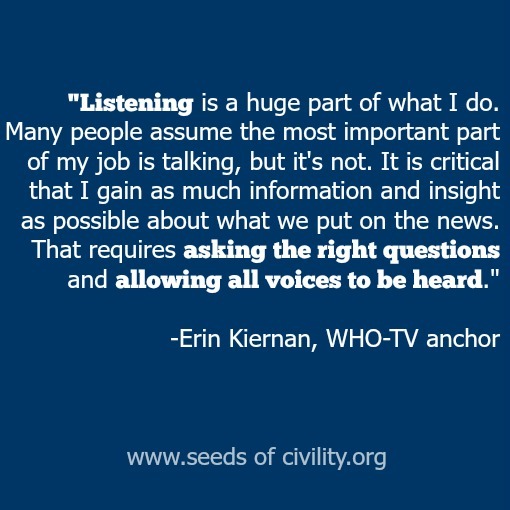 Listening to others and asking questions to understand his or her perspective. I like to remind myself that “leadership is not a title and not a position. It is a relationship. 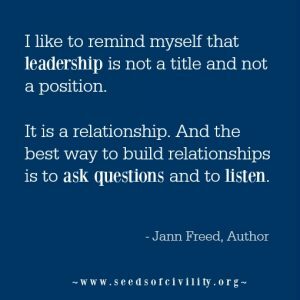 And the best way to build relationships is to ask questions and to listen. Leaders often want to do the talking and don’t make time to listen. 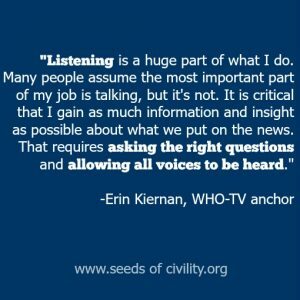 Leaders also feel we need to have the answers when maybe people just need us to listen. I often reflect on this story as a reminder to listen. 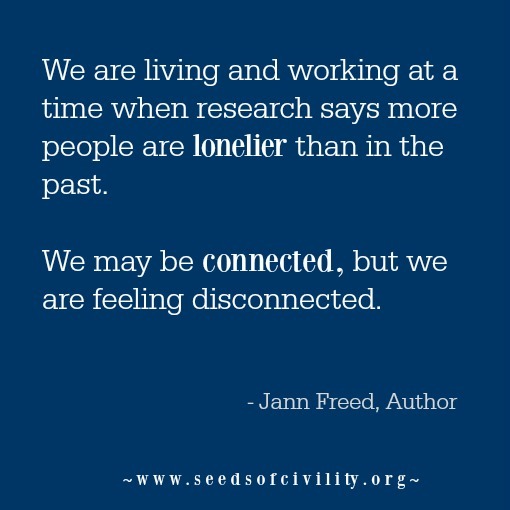 We are living and working at a time when research says more people are lonelier than in the past. 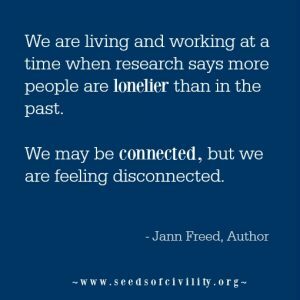 We may be “connected,” but we are feeling disconnected. People would rather text than talk. We have fewer people we can count on in times of emergencies and fewer we trust. Maybe people just need us to listen and not always try to solve all of the problems. Recognizing the efforts others have made by providing positive feedback. In the early 1980s when I started college teaching, Ken Blanchard wrote the book The One Minute Manager. His main premise was to take a minute and give feedback. When you see someone doing something right, tell s/he right then and there. Don’t wait until a performance appraisal. When you see someone doing something that could be improved, take one minute and tell them right then so s/he can start doing it correctly. I have always tried to do this. Since making postcards is my hobby, I also write a lot of notes. Research says that easiest thing a great leader can do to increase the support and engagement of employees and that is to recognize great work. Recognition directly affects morale and engagement. Handwritten notes trump email messages and public recognition in a meeting or peer group makes people feel even more appreciated. In times of tight resources when it is hard to offer other incentives, positive feedback and recognition only takes a little time. It is basically free. We should use it more often, but only when it is authentic. If it is not genuinely deserved, then it will not be accepted and not result in higher morale and engagement. While I send notes of sincere appreciation for the benefit of others, I have to say I am honored when I walk into the office and see my postcard posted on their wall or when I have students tell me they saved my cards. It must have made an impression which is reinforcement for me to continuing to take the time to recognize the efforts of others. WCI: Those examples really bring the concept of civility to life. The whole I idea of a leader being a person who is building relationships is powerful. Thank you for taking time to reflect on these questions. We look forward to your presentation on April 20th, 2016. The Wallace Centers of Iowa leadership and civility lunch series continues this week with the theme of Women in Leadership. Our guest speaker for the April 13th lunch is Lori Vande Krol. After receiving a BS in Mathematics from Iowa State University, Lori worked 13 years as an Actuary and Risk Manager before leaving the corporate world to found Life Made Simple, LLC in 2005. 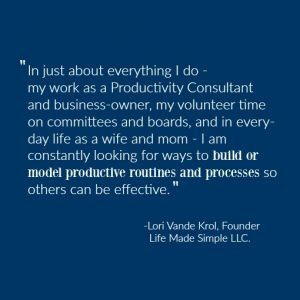 As a certified productivity consultant, Lori helps individuals and businesses implement and maintain systems to increase efficiency and effectiveness. WCI: When one looks at your background in actuary science and talent for helping businesses, it is easy to see you are a leader because of the impact you make. 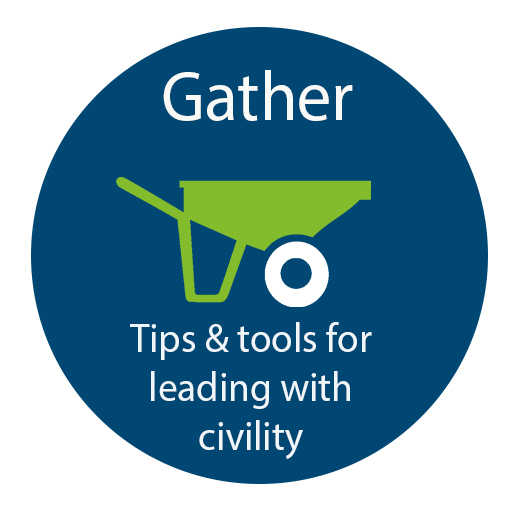 Which of the eight civility practices, that are taught through Wallace Centers of Iowa programs have helped you in the work you do? Paying attention to detail or noticing things other people might miss yet are important for results to occur is a civility practice I use every day in my career as a Productivity Consultant and business owner, as well as in my position as a board member for my industry’s national association. While being detail-oriented is a large part of organization and productivity, it is important to balance this with a big picture view in order to determine where to place the highest priority for use of time, energy and money. 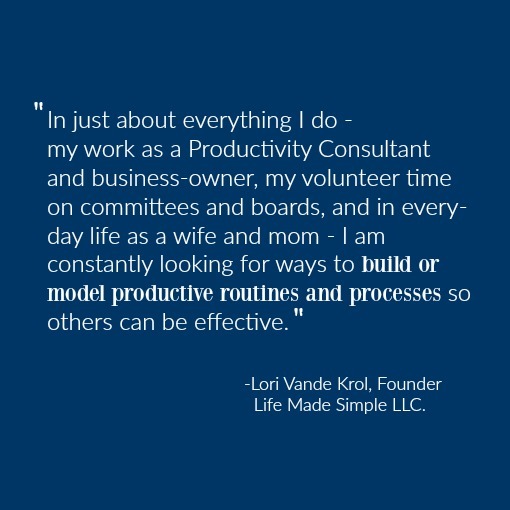 In just about everything I do – my work as a Productivity Consultant and business-owner, my volunteer time on committees and boards, and in every-day life as a wife and mom – I am constantly looking for ways to build or model productive routines and processes so others can be effective. My passion is in helping others to lead balanced, productive lives and implementation of effective habits, systems and processes is the basis of this. I’ve also learned how important this is in my own life in order to juggle all of the things I want to do and ultimately, to reach my career and life goals. WCI: Lori, those are great examples. 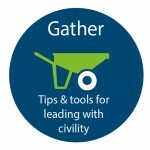 Thank for taking time to help bring these civility practices to life with practical insight.We look forward to your presentation on Wednesday, April 13th.